The Amish Clover Swivel Barstool provides seating for casual dinners, pre-dinner drinks and after school or late night snacks at your kitchen bar or island. 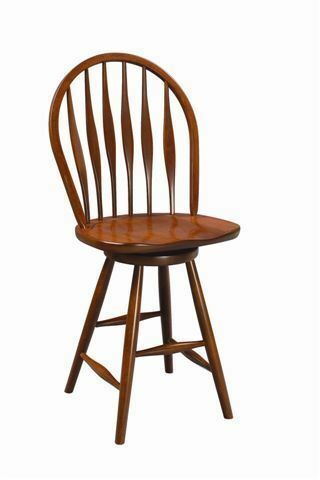 This is a Windsor style bar stool complete with paddle shaped spindles, a curved bow top and a fun swivel motion. The seat is contoured to offer maximum comfort like all good Windsor chairs are sure to do. Amish furniture gives you choices. Select the height you need to use and get the look you want with both straight and turned leg styles available. The Malibu comes in oak or cherry wood, adding luxurious seating to your kitchen nook, gathering table or bar. Premium solid wood in the hands of talented Amish craftsmen produces a breathtaking result. The natural characteristics of the wood are brought out, sculpted and shaped by experts. Amish Malibu Swivel Barstools will last longer, feel more comfortable and give you more for your money than barstools made of lesser materials. We're excited for Amish furniture to become part of your family's story. Please email or call a Furniture Specialist with any questions.